This focus of this book is on Caden and Maddie. Caden is one of the Hell’s Eight. Eight boys who were the only survivors of a massacre in the town they lived in. This attack happened when they were all boys and it bonded them all together. They had to survive on the streets until they were found by Tia, who took them in and basically saved their lives. They as adults built Hell’s Eight Ranch and became Texas Rangers. Their reputations are fierce and well known. 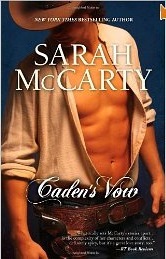 Caden is tired of all the matrimonial bliss going on around him and decides to leave and find his own place in life. Maddie is also living at Hell’s Eight. She escaped from a whorehouse she was born and raised in, taking refuge at Hell’s Eight. She is love with Caden and it’s a difficult situation. Maddie retreats in her own mind a lot. This causes others to see her as crazy or childlike. I looked at some reviews of this book and was scared to read it. They were not favorable. I agree that Sarah McCarty has slipped with the last few books in this series. The last book I truly enjoyed by her was Tucker’s. For me, Tracker’s and Shadow’s were borderline sub par. The stories were okay but the heat level was tanking and that was one of the reasons I have enjoyed her work so much in the past. I loved everything about this book. I can’t stress that enough. I think McCarty has hit her stride. The characters broke my heart, especially Maddie. She’s always been viewed as fragile and for most of the book she is, but you know a little bit more why. She is an extremely damaged young woman. She was pimped out by her mom at age eight. She cares horrific self-esteem issues. I was furious at some comments made by Caden to her about her. I openly bawled several times in this book because of her view of what she deserved for circumstances in her life she had no control over. Her defense mechanism was too retreat inside her mind and with her past it is totally understandable. Fans of this series will cheer this book. It is my favorite in the series easily.